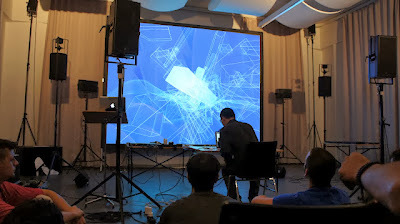 Digital artist, focuses on audiovisual performances that utilizes the observer’s perspective (birds eye view) and game-like strategies to destroy barriers common in tech art, hence submerging the audience in performance. The artist draws multiple lines in space according to the golden ratio, with every segment serving as an independent sound object. The length of each segment decides its frequency, and through a center point of control, harmonic geometric noise is triggered throughout the timeline.